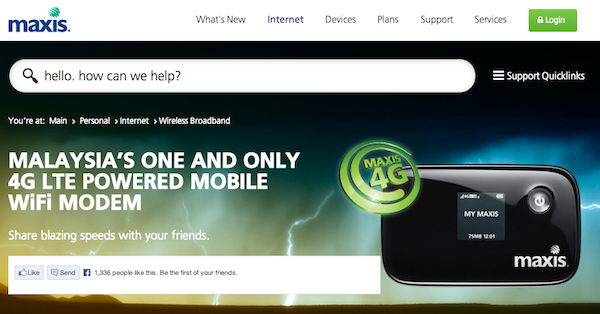 If owning multiple SIM cards that shares the same account isn’t your cup of tea because all your other tablets do not have a SIM card slot, Maxis recently introduced a new 4G LTE Mobile WiFi Modem that allows you to connect up to 10 devices at the same time, and enjoy amazingly fast 4G LTE speeds of up to 75Mbps. Worth RM500, Maxis is giving it away for free if you sign up for any internet plan of RM88/month and above (12 months contract). Maxis Wireless Broadband comes with 2 allocations of quotas, one from 8am to 2am and another from 2am to 8am. Peak hour refers to usage between 8am to 2am while off peak is allocated for usage between 2am to 8am, so if you have a lot of things to download, you know what time to start them so you can fully utilize all Maxis Wireless Broadband has got to offer. In order to be eligible for the deal, you will need to pay an activation fee of RM100 and a device advance payment of RM240 during your initial sign up. The advance payment will be credited back to you at RM20/month for the first 12 months. The key features of the 4G LTE Mobile WiFi Modem includes fast speed of up to 75Mbps, the ability to connect up to 10 devices simultaneously and a long battery life of up to 10 hours for each full charge. Of course, what’s good of a 4G LTE modem when you do not reside within the telco’s 4G LTE coverage area? Check Maxis’ coverage map in this link, or visit Maxis for more information and to check out the rest of their broadband plans.